But that shouldn’t be seen as a negative, because from my perspective that means there are lots of new seeds taking root which should set up 2019 to be a productive and positive year, if we can all hang in there and make it through to January. November saw me clocking up air miles, rail miles and a few car miles as I travelled from workshop to steering group, and from conference to meetings. I will share just a few of my favourites to show the breadth of our sector and the positivity that I see all around me. I was in Dublin a few weeks ago to see Professor David Wilson hand over his chain of office to the new President of the Chartered Institute of Waste Management – Enda Kiernan. I always find these events warming, as we hear about the highs from the previous 12 months from the outgoing President and the new ideas and plans from his successor. I have known Enda for a number of years through CIWM, and I am convinced he will be a great ambassador for the Institution and the sector more widely. He is calm, but passionate, committed and fun, and I hope many of you will get to share time with him at events in the next 11 months as the sector reacts to changing policy frameworks, addresses new targets, and works through the need to better align value chains to help close many material loops. But that wasn’t the only change at CIWM, as the new busy plan was debated across the centres and an action plan for refocusing the efforts of the institution have been put in place. As an Executive Board Member, I am committed to helping the senior management team at CIWM to focus on both existing members and new members who reflect the changing nature of our sector. The new plans for member support, training, competency and new member growth have been widely debated, well thought out and provide me with the confidence I need that things are going in the right direction. Which is great news given in November 2020 I will be taking over the reins of CIWM President from Trevor Nicol, and I will want a vibrant professional membership body that is at the heart of our evolving sector to be with me as I look to address the challenge of new. This includes new members, new offerings, and a new sector that needs professionals to play a central role in its delivery, and its future design. The following week it was all change, and the focus of a two-day workshop in Belfast, managed by the Cambridge University Department for Engineering, was all about open innovation in design and value chain alignment around future products and services that can move beyond the current plastics debate. Participants included Moy Park, Crown, Novamont, Cargill, Domino, Heineken, Mars, PepsiCo, Siemens, and the Wallgreen Boots Alliance, and over the two days we heard about the problem of packaging waste, listened to case studies of innovation and partnerships. We were assigned a specific sector in which we had to design a new product for sale that would meet the needs of targeted consumer groups while also improving the environmental performance of the business. This was nothing short of chaotic, as this is usually done over several months, but the level of enthusiasm, willingness to share, and real insights from the experts meant we all had something to showcase on day two. 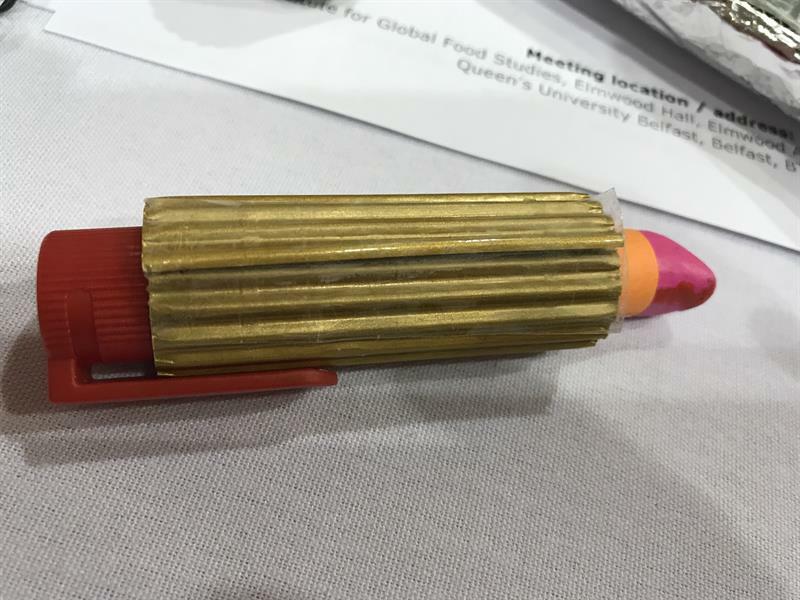 My team came up with an innovative new lipstick, the holder being made of recycled aluminium and customised to add value to the user. You could then have interchangeable lipsticks that could fit in to the holder. The lipstick holder would be ‘chipped’ so that you could get messages via a phone app about local stores stocking your favourite lipsticks, advising on new colours that would suit you based on previous consumer choices. It could also tell you how much of your lipstick was still viable to help ensure you never run out. Proof of the pudding was in the pitch, and the images from the pitch are here to view, I hope you like what we could do in under give hours with just some basic Blue Peter style ingredients. Last week was just as busy, although closer to home given my residence for the week in London. It involved a number of discussions involving the ESA and a proposed sector deal for waste and resources, a seminar on how to value resources better and a workshop looking at the proposed new Environment Bill. This looked at what this must deliver for the UK environment as a whole but also for the waste and resources sector in particular. The Aldersgate Group workshop on the Environment Bill was the official launch of the Broadway Initiative Report Blueprint for an Environment Act which I had participated in for several months. The report challenges government to take this once in a lifetime opportunity in a post-Brexit UK to put the environment at the heart of their decision-making, by enshrining environmental principles in UK law. It also offers the chance to create a new body to act as a watchdog- one with teeth- to hold government, its agencies and delivery agents to account. I was also lucky enough to sit next to Therese Coffey, the Environment Minister, who has a genuine positive outlook on most things right now. She did confirm there were a lot of big balls being juggled at the moment, but that they should all be put to bed by Christmas-my phrasing not hers. This suggests to me that we will not only have Brexit sorted in the coming weeks, but we will also have the Resources & Waste Strategy out along with the associated consultations (EPR, DRS, harmonisation of collections). We should also see the draft Environment Bill. So as I predicted last month in my blog, Christmas won’t be a time to switch off entirely, there could be quite a lot of reading to be done, and I am not alluding to that book your in-laws gave you last Christmas. The annual ESA Christmas Lunch was well attended and proved to be a great end to the busy week. We welcomed Phil Piddington to the Chairman’s role, in what will undoubtedly be a rapidly evolving and transitory two year period. I love this event, and always look forward to seeing so many good friends whom I might not see that regularly in my current role while allowing me the time and environment to chew over industry issues with clients, colleagues and the competition. Thanks again to the ESA team for starting my Christmas Season off so well. But this won’t be the last of my sector-based Christmas functions. Next week I will be enjoying a good old knees up with colleagues from LetsRecycle.com, and joining the CIWM NE Centre for its Christmas lunch and final open meeting of the year, where I get to polish off my crystal ball and look at where the sector will be 12 months from now. Here I am attending in my Junior Vice President capacity with Enda and Trevor already occupied at other regional CIWM events. My final Christmas engagement will be with the London & Southern Counties Christmas Lunch on 14 December at Old Billingsgate where the largest gathering of waste and resource professionals will be enjoying one another’s company. If I see you between now and Christmas then I will wish you the very best in person, but if I don’t this will be my last blog for Recycling & Waste World in 2018. Let me take this opportunity to wish you a Merry Christmas and a Jolly Good New Year. Normal service will resume in early January, but until then enjoy your time off, and don’t put off reading those consultation documents until the 2019. Ho, Ho, Ho!